Wednesday the temp were in the 50's so I removed the insulation from the south side of the hives and almost immediately bees came out of all three hives and began their evacuation flights, you could almost here the sighs of relief. I cooked up so syrup and HoneyBHealthy and placed it in the lawn between all the hives. They found it forthright and within a couple of hours the 2 quarts were gone. After they were done flying, I picked up the feeder and brought it inside to clean and refill. I found that many bees had crawled inside and became soaked with the sugar water and had died, so I tossed them in the trash. 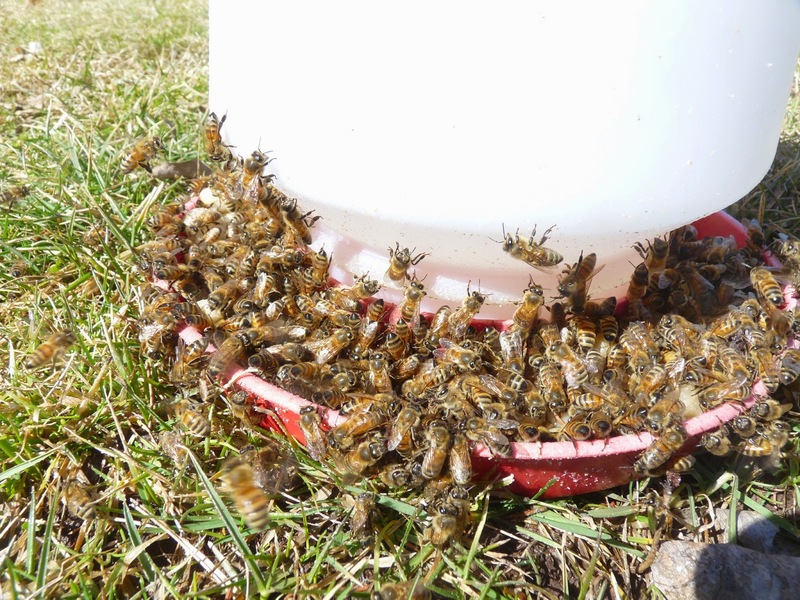 The next morning I found all the bee's alive and waiting at the rim of the trash bin so I collected them in a basket and waited for the temp outside to warm so I could bring them back. I then refilled the feeder and placed it back outside. Cool day so not to much activity. Transitioning from nuc to octagonal hive.